I had always thought you couldn’t update Windows Server editions from one to another without a reinstall as allegedly the base software wasn’t the same even though we all knew it was really just a file or two or registry key or two that needed to be changed. This in fact wasn’t possible until Windows Server 2008 / Windows Vista SP1 which introduced Windows Edition-Servicing Command-Line Options using a built-in utility called the Deployment Image Servicing and Management (DISM) tool which doesn’t require any media to upgrade the edition and just needs a reboot. I’ve recently had to do this with Windows 2008 R2. My home PC died an unceremonious death last week. No fanfare, nothing dramatic…it just wouldn’t boot. I went through the usual troubleshooting. BIOS would load, it looked like everything was working, it could see all drives. When I had a bootable DVD in the drive it asked nicely if I wanted to boot from DVD. When bypassing this is just stopped with a lovely little blinking curser in the top left of the screen. Wouldn’t see the old hard disk. Booted off two different Ubuntu CDs which would go through initial startup and hang. Ran Memcheck….memory all passed. Didn’t think it could be CPU as that generally doesn’t partially fail. I tried reseating everything, pulling out all additional PCI cards, etc. Landed up trying with only one of my two DVD drives (1 x SATA and 1 x IDE) connected and still Ubuntu wouldn’t boot. So, it dawned that it must be a partially dead motherboard, a trusty 4 year old AMD Asus board that has served me well. I went straight onto Ebay to see if I could get another as a direct replacement and found plenty of faulty ones for sale and a refurbished one for well over £100. So, I decided to bite the bullet and go for an upgrade. I decided on an Intel Core i7 Quad Core 950 CPU with 12Gb RAM and a Gigabyte Motherboard, perfect for running all those lab virtual machines. Everything was delivered and I started the task of swapping everything over. It took quite a while actually to do the physical changing as the heatsink instructions were pretty bad with small black and white grainy photographs trying to show which way round the fan was meant to go. I was even very keen and plugged in all additional riser cards and my USB devices and hit the power button. My new PC booted but wouldn’t boot off the boot drive. That was easily fixed by going into the BIOS and selected the boot device. Next attempt and it started! I logged on and waited a few minutes for devices to be recognised and drivers installed, rebooted again and nearly everything was working. I only had to install the Nic drivers separately. I do need to reactivate Windows but I’ve been given three days to comply. I always wait until the last minute for this kind of thing just in case something does go wrong and I need to backtrack. Most impressive however was that Windows 7 actually booted and didn’t have an issue having AMD ripped out from underneath it and Intel put in its place. Saying that I shouldn’t really be that impressed, I should have expected this to just work. Doesn’t windows CPU support rest with the Hard Abstraction Layer (HAL). As Abstraction is in the name you would expect there to be no issues but this certainly hasn’t been the case with previous versions of Windows when I’ve had to do this. I’m very happy to report this is not required now with Windows 7. So kudos to Microsoft for getting the abstration thing working a little better. One of the reasons to go virtual is to have this hypervisor layer between the OS and your hardware so you don’t have to worry about changing the underlying physical kit to a new model / supplier / version, seems like the OS is growing up as well to be able to handle this all by itself. 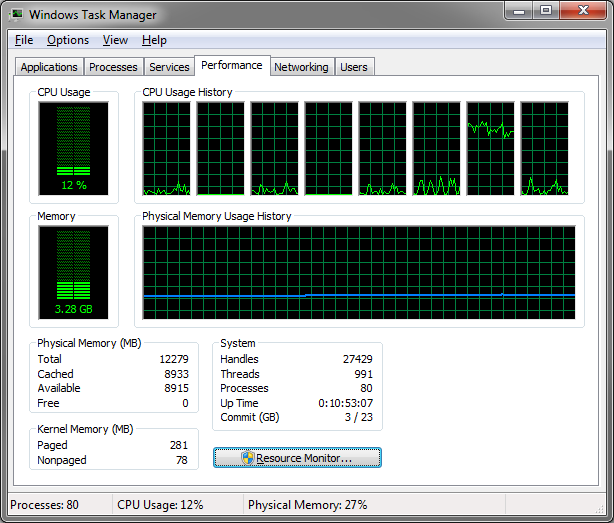 I must say I am very happy to see this in Task Manager after a week of no PC!